From this conversation, I was wondering what's the usual elsewhere. Here, assuming there's no rain or front systems passing through, the nightly lows will usually be close to the late afternoon dew point. On dry days, slightly less, as air condenses a bit overnight (current dew point 44°F, forecast low 39°F). Along the coast, that's NOT true; the lows are usually somewhat warmer than the dew point and even more so in NYC due to heat island effect (Manhattan: current dew point 40°F, forecast low 56°F). Here in my experience the low is usually a few degrees warmer than the afternoon dew point. In the warm season especially, the dew point often rises as the sun sets. 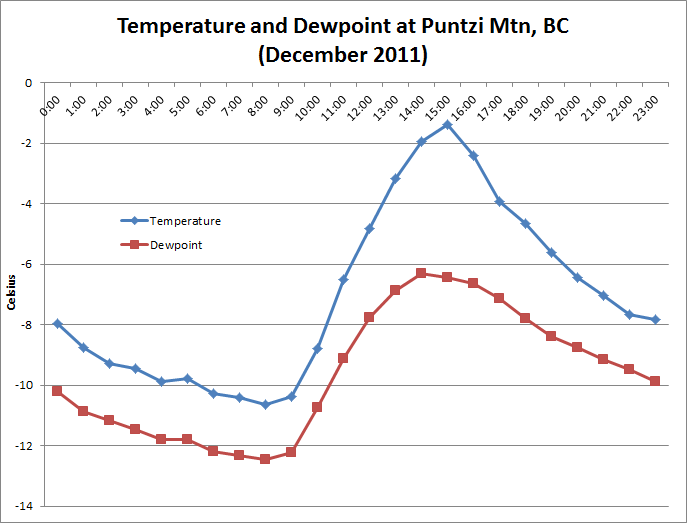 For example, yesterday, dews were around 4°C in the evening, but we dipped only to around 10°C. Orly airport is affected by the UHI as it's surrounded by suburbs, though the effect isn't that strong. I guess it also has to do with it being oceanic. Dew point is "point de rosée" in French. When there's snow on the ground and the skies are clear, the dew point usually drops with the temperature and rises in the morning with high humidity all day long. I guess that's universal. Tricky question, as I haven't followed so closely, but from the experiences from this summer, I can't see a correlation. Especially in June and July the afternoon dew points were rather low, often in single figures C, but overnight lows around 13C. Now when the humidity is on the rise, afternoon dew points are higher than the night lows. Right now temp is 20.9C and DP 12.1C, but overnight lows have been in single figures except for last night. 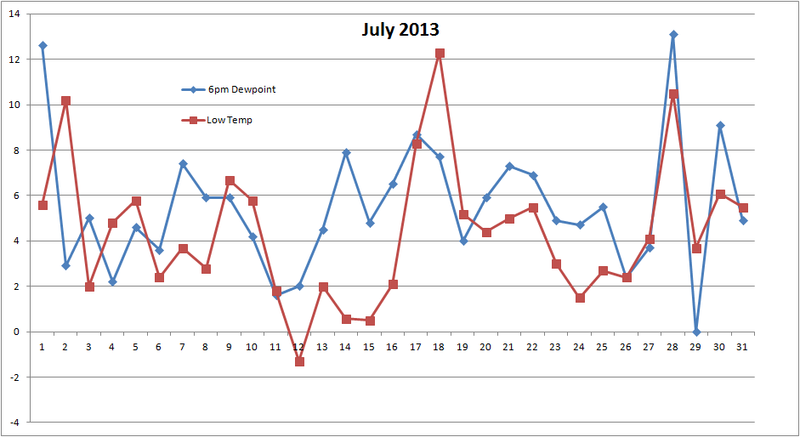 As we are very humid during evenings and nights in all seasons, the temp drop rather slow during summer. As the nights are also very short, the low starts to rise with the sun just when they've dropped to low figures. Because Dewpoints aren't included in NWS's F6 data or even the CLI I honestly don't follow closely as a comparative thing. But grabbing the data here's a graph I put together for the closet official station near me. Like you said... the low are usually warmer. Nice call. But would a different month or season be different? Waters are cooler in fall and winter so would the mins be lower then DPs? There's a big difference between summer and winter. Here is a comparison between one randomly chosen place here in British Columbia. 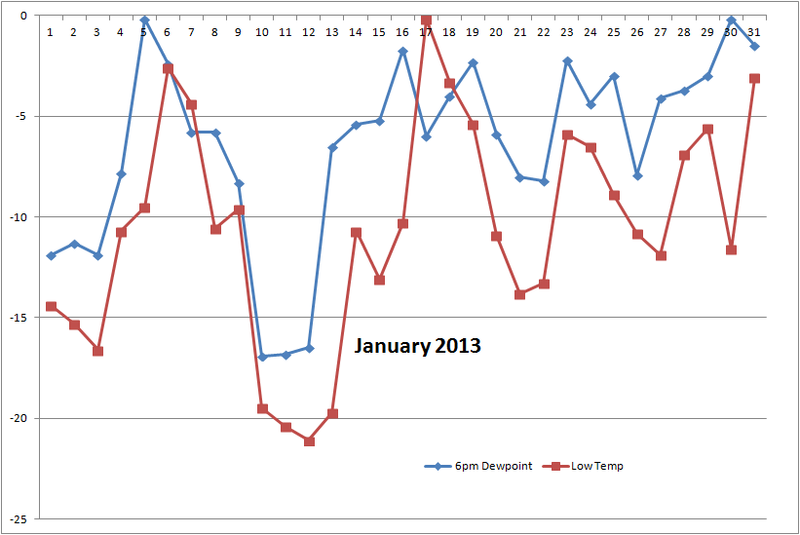 Notice that in December the overnight low is much colder than the afternoon dewpoint. The temperature in the early morning is about the same as the dew point, usually. Nightly lows usually decrease to the dew point, so you see dew on the grass. That's just another reason I love nights in the 70's. The dew points are in the 70's too!!! 6 pm was often among the lowest dew point readings of the day. The dew point often peaks around noon and/or in the mid-evening, the driest time of the day being late afternoon / early evening. The January 6pm dewpoint is 4.1 degrees higher than the overnight low; the July 6pm dewpoint is only 1.1 degrees above the overnight low. In summer, I would say that the overnight low is usually a little higher than the afternoon dew point. 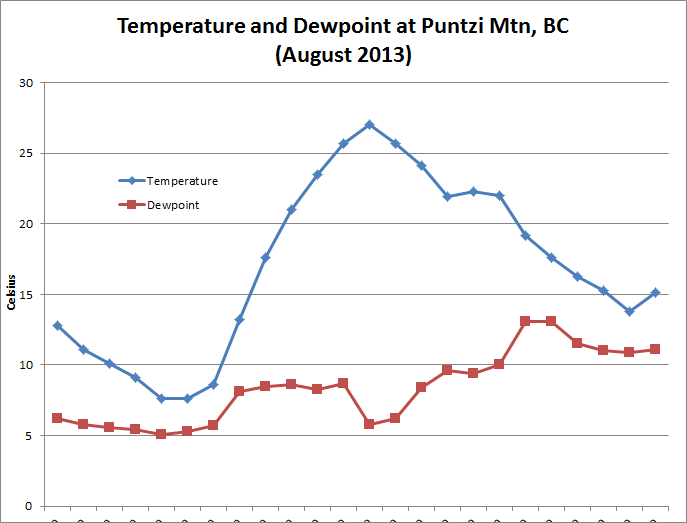 A typical summer day has a dew point of 15-17C at 3pm, and an overnight low of 17-20C. With unusually dry days the difference is bigger. An afternoon dew point of around 5C would rarely result in a minimum lower than the low teens, and it could be above 20C if the day was very hot, which is often the case with dry air masses. In winter it is the opposite however, as the overnight low is usually a few degrees below the afternoon dew point. The afternoon dew point is usually a good indicator of what the minimum will be though.